Otay, so the season’s already begun with its yearly evening race under the Desert stars of Qatar - having awaited the replay last Tuesday morning, since I’d been watching the IndyCar race instead when it originally aired in the same time slot - thus I spent the corresponding Sunday night and Monday in a semi-news blackout state in order to not hear the results; SHUSH! Thus, my quick picks for the season were made prior to watching the race or reading 1993 GP500 World Champion Kevin Schwantz’s MOTO GP preview; as obviously George Lorenzo has to be the hands-on favourite for repeat champion this season, right? With his title rival most likely being Dani Pedrosa - provided he can stay healthy for an entire campaign. Then there’s The Doctor, aka Valentino Rossi who’s returning to Yamaha this year alongside his arch nemesis Lorenzo, as these two had a strained relationship in the past which saw Valentino depart for a miserable two years with his home country’s marque Ducati. Thus can thee Doctor return to his past form and challenge for the title aboard his ‘YamaHopper? Meanwhile The Kentucky Kid , nee Nicky Hayden continues his turbulent times at the ‘Duc (Ducati) now being joined by ‘DOVY, aka Andrea Dovizioso who takes over his departed Countryman’s seat, while surely the mighty ‘Duca’s should improve now that they’re under the ownership of Audi AG. 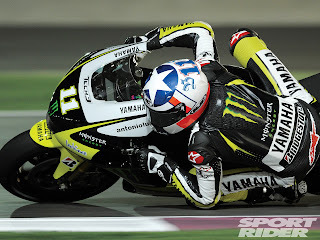 Ben ‘ELBOZ Spies who got unceremoniously dumped from his Factory Yamaha ride by Rossi had originally announced his intentions to retire from the sport, a la Casey Stoner, albeit Spies’s career doesn’t hold a candle to the retired Australian rider to date - who’s gone ‘TinTop racing instead. Fortunately for Mwah, Spies reconsidered his hastiness to depart the pinnacle of two wheeled racing and instead found refuge at the Privateer Ducati Pramac Racing team, which would seem to make him a long shot for victory this year, but could he be sticking around to move up to the factory “Works” team in the future? Cal Crutchlow is another rider to keep an eye out for, as he seems like a Hard Charger aboard the Monster Tech Twah Yamaha, while I’ve never heard of this upstart rookie Marc Marquez, who I did hear was fastest in Friday’s practice session. Meanwhile Marquez & Crutchlow were all over each other like two mangy ‘Hoonds scrapping over a bone for the final podium position while Pedrosa seemed barely able to hold them at bay; as there definitely didn’t appear to be any Marquez is FASTER than you radio instructions being issued from the Honda pits, while Marquez did seem cognizant of the fact that it might be unwise to turf off his teammate in his debutant B-I-G Bikes race. First Marquez passed Pedrosa for second place finally and appeared to be somewhat checking out whilst Crutchlow sniffed around the languishing Pedrosa like a hungry blood hound who’d found the scent for third place. Yet Rossi came racing into the picture like a shark smelling blood in the water and swiftly pounced first upon the frustrated Crutchlow, then picked off Pedrosa and gave the upstart rookie Marquez a nod as he passed him - saying who do you think you are boy? But I was absolutely amazed by the audaciousness of the 20-year old Spaniard, as the two-time MOTO2 champion was having none of I-T and pulled a ‘Mega Balls to the Wall outbraking pass into corner one upon a somewhat unexpecting Valentino, who then subsequently repassed Marquez and rode like the devil whilst trying to seek some respect from Mark’s elder, not to mention apparently MOTO GP’s elder statesman... While Marquez seemed content to consolidate his amazing third place finish upon his debutant MOTO GP outing, with Pedrosa a disappointed fourth and Crutchlow surely a dejected fifth place, albeit the Brit should take solace in being the first Satellite Scooter amongst the leading Factory bikes. Nicky Hayden and Ben Spies each improved their respective starting grid spots by three positions apiece with Nicky winding up eighth and Ben tenth, as I was totally unawares that Spies has had shoulder surgery, apparently to repair a ligament in his right shoulder, as I think it was Greg Kramer relating how ‘ELBOZ was suffering from the mostly right hand turns on the Lasalle circuit and would be recuperating for awhile. Thus, I can’t wait to see the action on SPEED from the Circuit Of The Americas this Sunday, although I don’t think you can get quite as close to the action as I did some two-plus years ago at Indianapolis. As I cannot describe the sensory overload of standing along the front straight fencing watching miniscule coloured blobs hurtling past Mwah at 200mph! While I’m certain Spies’s rookie season and debutant pole position upon the factory Yamaha ride seem a lifetime ago, eh? Top 10 Formula 1 Crapwagons? Bahrain GP, not Politicalized, really? Ecclestone: Bahrain Must Go On! Will AJ become the next Dario? NBCSN Says IndyCar Ratings are Pumped Up!